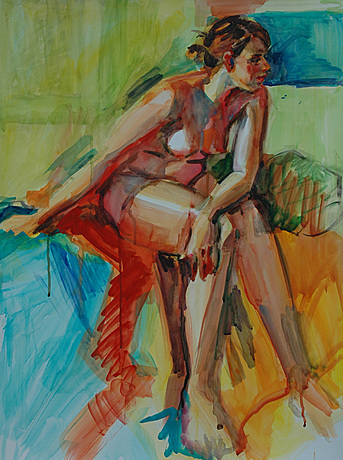 Study With Red Scarf, Watercolor, 30" x 22"
Figures and portraits are my signature work which has been evolving over the forty years that I have been attending a weekly, painting group with live models. These three-hour sessions keep my style loose and encourage me to work fast and focussed. In the past, I have used acrylic, pastels and oils; however, the unpredictable nature of watercolor always presents a challenge, especially since i position my painting surface nearly upright. Holding two degrees in Art Education, I taught high school art until, with direction notably from Daniel E. Greene and Don Andrews, I turned my attention to becoming a full-time artist. I am a Signature Member of the Northwest Watercolor Society, an active member of both the Watercolor Society of Oregon and the Hawaii Watercolor Society, and have received numerous awards in these and other juried, national exhibitions. I was recently part of a four-person exhibition at the Coos Art Museum, in Coos Bay, Oregon, entitled "In Fine Form: Figures by Four."